I took this shot of a classic automobile dashboard at a car show held at the Gilmore Car Musuem in Hickory Corners, MichiganThe museum has a terrific collection of cars spanning the decades, and they also have some nice special events. I’m attracted to older cars, particularly those of the 30’s, because they have such wonderful design elements. 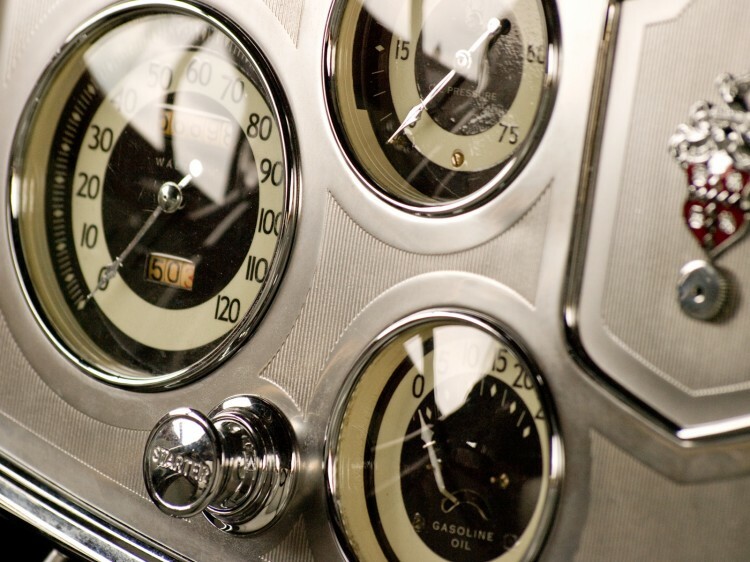 This dashboard to me just oozes craftsmanship and design. Note: I originally thought this was from a Cord, but as one commenter notes below this is more likely from a Packard. I’ll keep my eyes peeled to see if I can fully identify this vehicle. Update: I can definitely confirm that this is from a Packard but I’m not sure the exact vintage or model. My guess is that it is mid 1930’s. I recently went to a show which had a few 1932/33 Packards and the dashboard’s were very similar but not exact. This shot was taken with my 70-300 telephoto because I wanted to get a shallower DOF on the image. I converted the image to black and white, but in reality the color image isn’t that much different, just a bit more color in the gauges. There was minimal post processing work, mostly curves adjustments. I posted an alternative version of this image with a square crop to Flickr. I found that this image makes a great little avatar and I also use it as my background on my Twitter page. This image can be purchased. Other vintage car images available at ImageKind in my Automobile Details gallery. Very nicely done! Me like. This is one of my favorites. Great shot! I love detail images. Wrong picture of an instrument panel. This photo is of a Packard and not an 810 or 812 Cord. This I know of as I have driven and worked on 810/812 Cords since the 50,s and having put over 77,000 enjoyabel daily driver miles on our two 810 Cord Westchester sedans. The Cord instrument panels are a truely time tested design and at night the numerals are a beautiful green. Thanks for the other Cord photos . You could very well be right. When I take shots like this I try to also get a full shot of the car, or some other item which helps me identify it. In this case I don’t have such a shot. I’m not sure why I marked it as a Cord, but I’ll certainly do some more research to verify that it is or isn’t. Thanks for pointing this out. 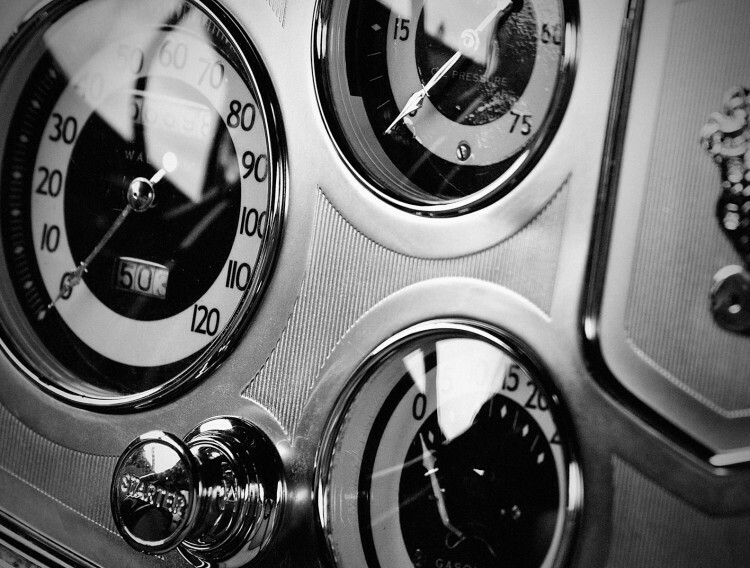 Some more research confirms that this is a Packard dashboard, but I don’t know the vintage.